Low Carb Donuts | Chocolate Glaze! I love a good donut every now and then, and I do have a favorite - Dunkin Donuts chocolate glaze - so when we created these Low Carb Donuts that taste exactly the same I was beside myself! Not only are they low carb, but they are flourless. Chocolate glaze, flourless donuts that taste high carb, but are low carb? Sign me up!! Are You A Fan Of Cake Donuts? Aren't we all a fan of cake donuts. Don't get me wrong, I love a fluffy donut that just melts in my mouth, but when it comes to chocolate cake is always best. These donuts are hearty, but moist. In fact the donut batter would probably even make a great chocolate cake! Cake donuts make me think of summertime at the beach - when you're too tired from being out in the sun and ocean all day, cooking dinner doesn't sound as exciting as getting a box of your favorite cake donut from the local bakery. The best part about these donuts aside from the flourless, low carb part is that they are made with protein powder. Many of us have trouble hitting our protein goal day to day so having a protein friendly donut lying around can always come in handy! As usual we are loyal to our favorite zero carb protein powder Isopure, except this time we use unflavored so that the chocolate isn't hindered by another flavor. If you're in the market for more flourless desserts, and aren't we all, you should give our no bake cheesecakes and low carb custard a try! Hey, maybe the custard can act as the icing for your chocolate donuts. Either way, dessert is always a must have in our household, and we know most people feel the same, so make your dessert tonight guilt free with these flourless, chocolate glaze, low carb donuts! 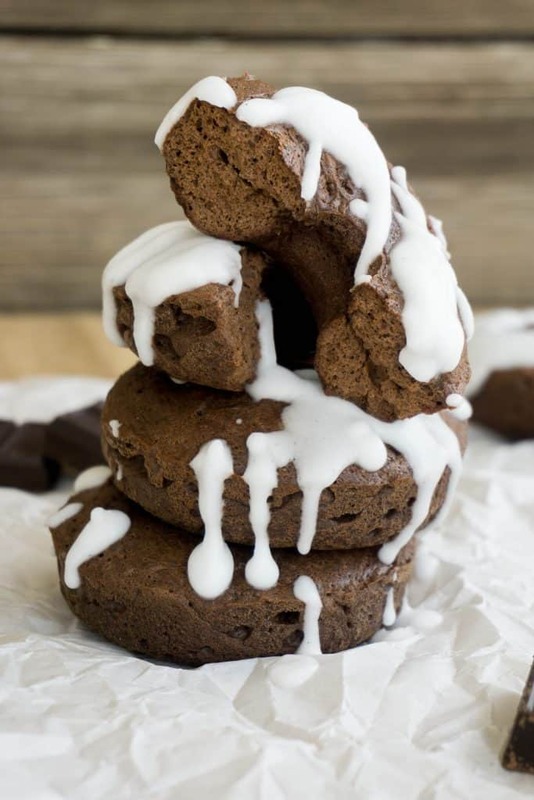 Recipe can be quickly added to MyFitnessPal - Search "KetoConnect - low carb donuts"
Keto Donuts | Chocolate Glaze! Add cream cheese to a microwave safe bowl and microwave for 30 seconds or until soft. Add olive oil to cream cheese and mix using a whisk or hand mixer. Add in the eggs, vanilla extract, heavy whipping cream and stevia, and give it another whisk until fully incorporated. To another bowl add the dry ingredients - protein powder, coco powder, baking powder, xanthan gum and salt and combine. Add your dry ingredients to your wet ingredients in two part and thoroughly combine. Pour all of the donut batter into one corner of a ziploc bag, cut a medium size hole and fill your greased donut mold. Bake at 350 for 25 minutes. Allow the donuts to cool for 15 minutes prior to glazing. Enjoy! NOTE: In the video we made 3 very large donuts, but we think this will better make 4 equal size medium donuts! Add sweetner to a bowl with 2 tbsp of milk and vanilla extract and combine. Dip donuts in glaze or drizzle over the donuts. Allow to rest before eating for the glaze to harden onto donut. NOTE: If you don't have confectioner you can turn granular into confectioner by pulsing it in a coffee/spice grinder for 5-10 seconds.